Saying that, there are two faces to downtown Nashville. The lively, party all night area that has streets laden with Cowboys and tourists. And the other side, calmer more laid back which is a bit easier to take. Our hostel is the biggest overpriced joke of accommodation ever and we try to spend as little time there as possible. So we head to a district of Nashville called Germantown, a neighbourhood full of old Victorian buildings, a great local farmers market and some promising Coffee stops. It has taken us over an hour to walk to steadfast cafe but the house made muffins, any flavour, are enough to compensate. The coffee has been infused overnight in their homemade butterscotch to make my latte, which still has its defining caffeine hit and Steve is content with his own teeny individual chemex. The space is light and airy with outdoor seats on the patio and they serve a great looking lunch menu with a specials board just for innovative coffee variations. Wombling around town for dinner we come across 'Pinewood social'. They have had one of the best ideas ever! To create a restaurant that is open all day to serve breakfast, brunch, lunch and dinner. Have a separate coffee shop area serving freshly made pastries. A full bar laden with beer, wine and cocktails galore......and a Vintage look bowling alley! 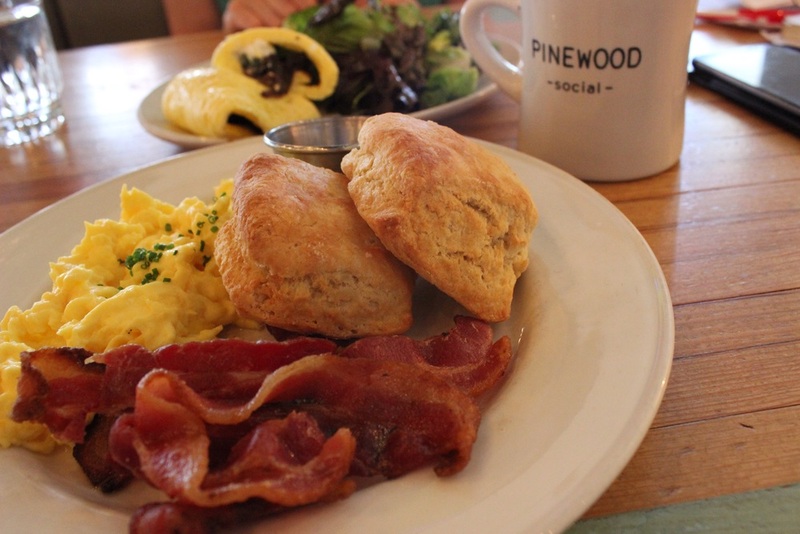 Went back for breakfast at pinewood social ... Biscuits and bacon . Dinner has never been so fun! The menu is full of Inventive dishes and the meatloaf is ridiculously good. Moist and meaty it comes wrapped with a bacon ribbon and smothered in a peach salsa. A side of roasted broccoli florets have the most satisfying, crispy texture and for dessert, Georgia is overwhelmed by her skillet cookie. A huge melting mess of gooey chocolate chips and burning hot cookie dough, served in a her very own skillet pan with a helping of swirled vanilla and chocolate whip ice cream, yum! It's another beautiful day for a barbecue and we have a recommendation from DJ BBQ to try out one of the locals. 'Peg leg porker' are known across America and compete in various BBQ competitions yearly. Most famous for their dry rub, we are persuaded in that direction and grab the pull apart ribs, smokey BBQ beans and BBQ nachos covered in tender pulled pork, jalapeños, cheese and their own BBQ sauce. Now we know why this place is so popular. Clearly a lot of heart and passion go into producing this food and its rammed with locals. It's nice to be a bit away from the bustling heart of Nashville and to relax with one of peg leg porkers varied selection of chilled local beers. Suitably stuffed now, we're off for some line dancing! Nearly at the end of our adventures people, not sure how we're going to cope when we have no money to eat out every night.